One of my favorite trends of the season is layered jewels. Necklaces, bracelets, rings….the more the merrier. (I’m pretty sure Rachel Zoe would agree with this statement as well). 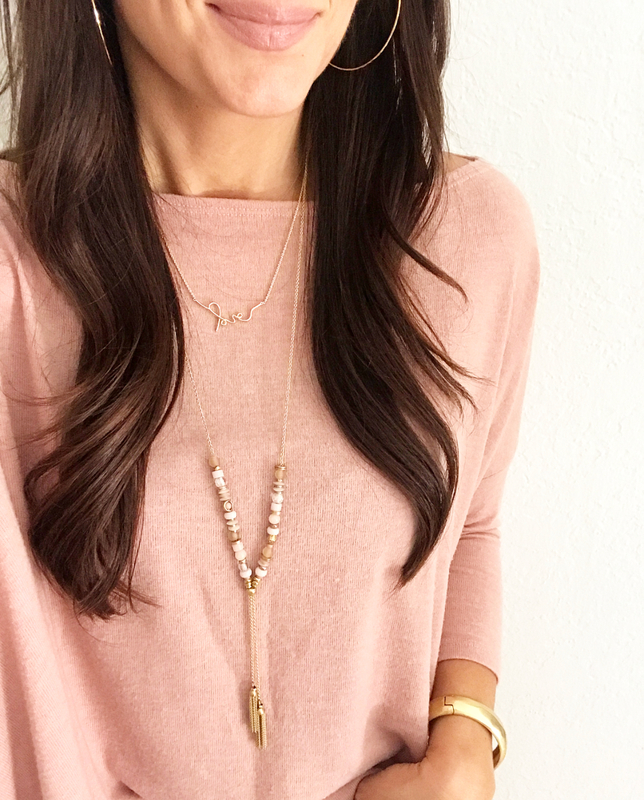 Since today is the last day of the Stella & Dot necklace sale (buy one necklace, get the second for 25% off), I thought I would round up a post of some of my absolute favorite necklace combinations. If you want to layer your jewels, but don’t know what type of top to wear, pick a top with a crew neck to make it easy. 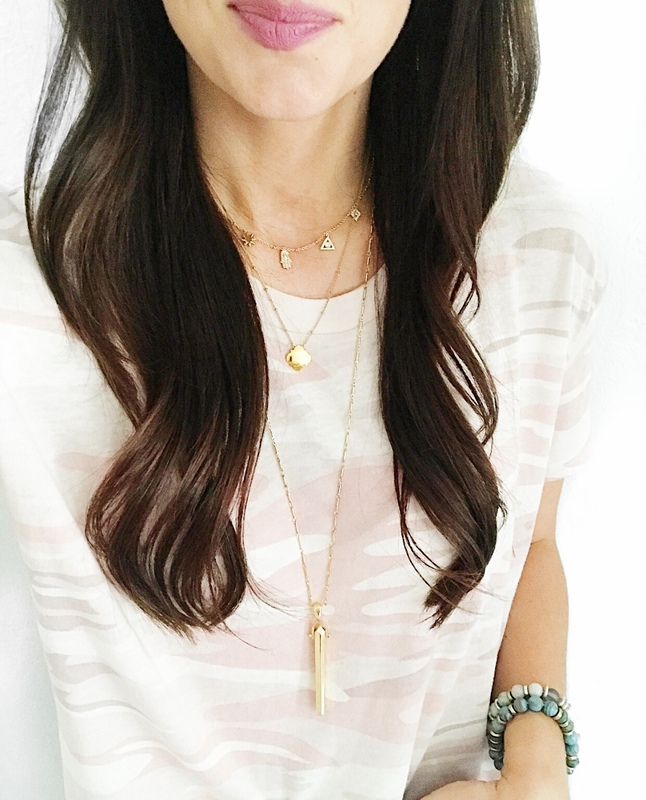 Necklaces layer very nicely and simply over the front of a crew neck shirt or blouse so it makes styling a no brainer! I’ve always gone by the saying “one on the skin, one on the fabric” when layering jewels over a v-neck tee. What does this mean?! Pick a delicate necklace that’s shorter to layer first (touching your skin) and then pick a longer necklace to layer over (touching the fabric of the shirt). This little trick always helps me pick which jewels to layer more easily. In fact, mixing silver, rose gold, and gold jewels together is actually super on trend & fun. I honestly rarely think about matching my metal tones now. I just wear what I want to wear, gold, silver or rose gold and it all flows! 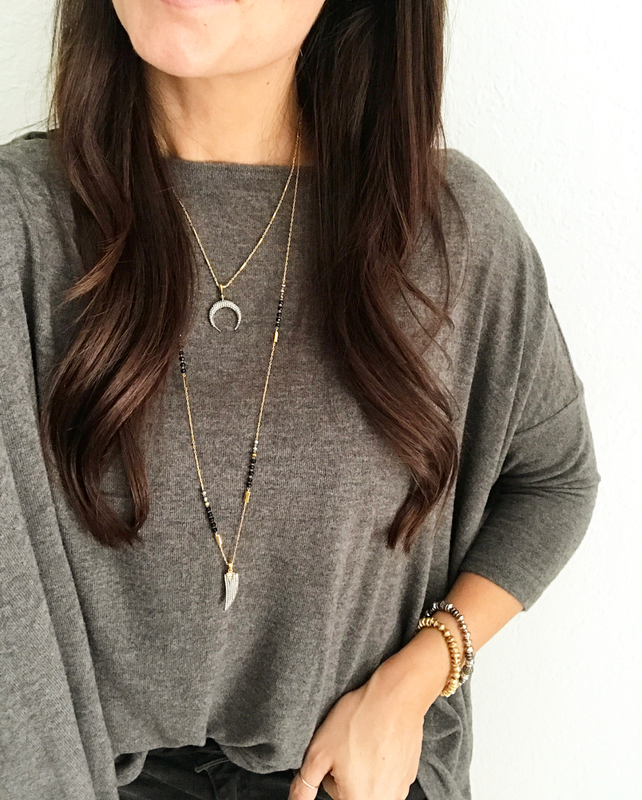 Some of the Stella & Dot pieces I love the most are mixed metal, which makes your layered necklace look very balanced and gorgeous! 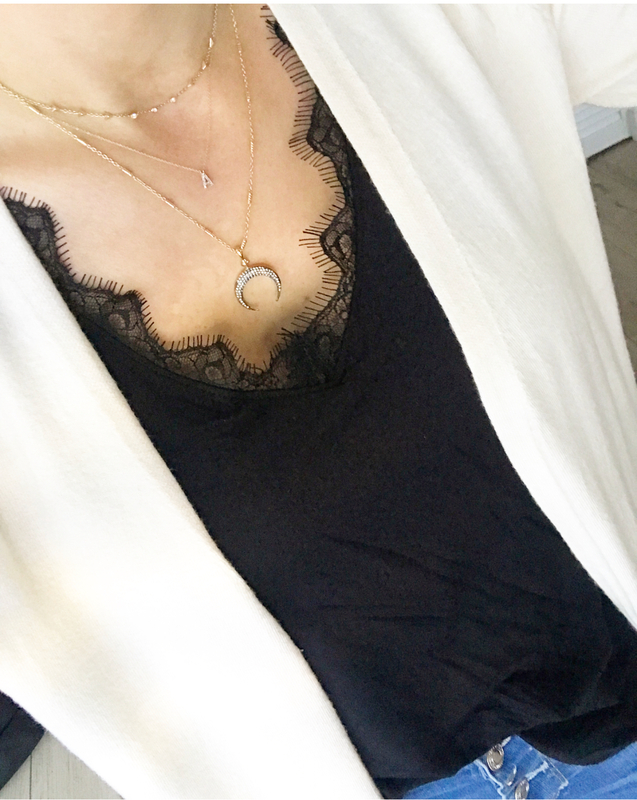 (Our Luna Pendant necklace is hands down my favorite mixed metal piece – seen above). If the top, blouse or dress I’m wearing has a busy pattern or large lace detail, I’ll pick super small and delicate layers. 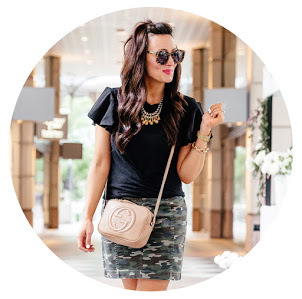 The last thing you want to do is make an already busy outfit look like too much is going on! I hope these little tips and tricks help you next time around when you are picking out which jewels to wear with pieces in your wardrobe. 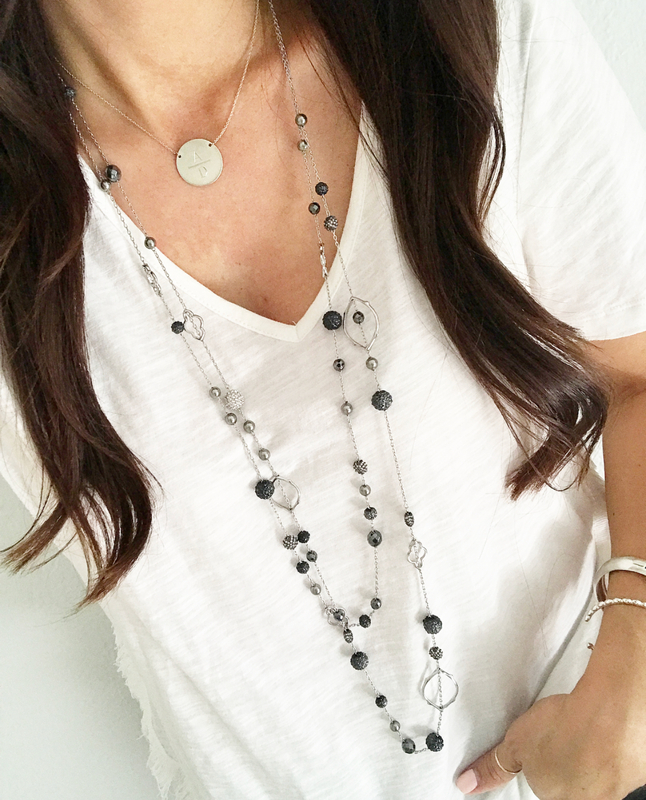 And don’t forget….the buy one necklace, get one for 25% off deal ends tonight! Every single necklace seen in this post is included in the sale!